This is by far my favorite way to cook salmon. Salmon is a fatty fish, which means that it can take on some pretty bold flavors. This “sophisticated honey mustard” packs on the flavor with just a few, simple ingredients. Less is always more in the kitchen when you use the best products. I prefer to use whole grain Dijon mustard if you can find it, but any strong Dijon works fine. The same goes for the maple syrup: finer quality means that you only need a few tablespoons for a sweet and piney taste that is the signature to this meal. Lightly season salmon with salt and pepper and place on a sprayed baking sheet. Mix together mustard, syrup, cayenne pepper, and lemon juice in a bowl. 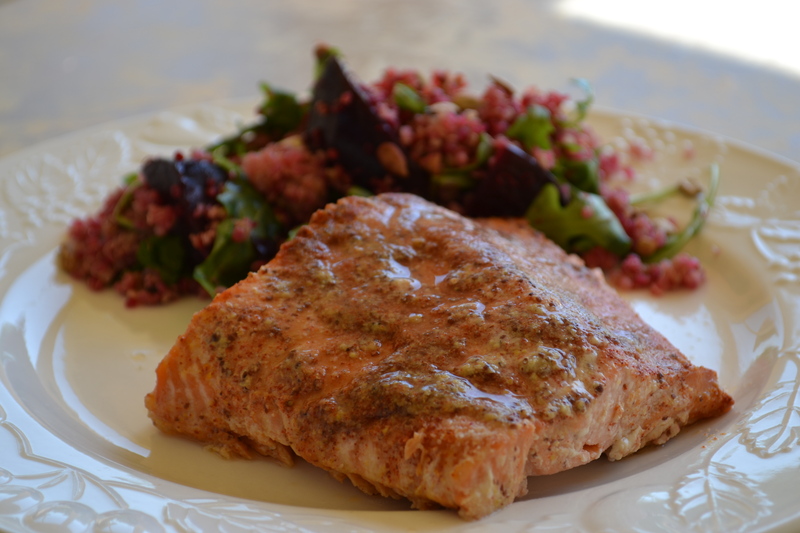 For a sweeter salmon use all 3 tbs of syrup, for a salmon with more of a spicy kick only use 2 tbs syrup. Use a spoon and generously top the salmon pieces with the mixture. Bake for 12 minutes for medium, closer to 17 minutes for well done. So easy and so delicious! I will definitely be making this regularly! !